Home > TechEntice Byte > Sharks have two penises: Research reveals how? Sharks are apparently the luckiest creatures on earth. Why? Because they have two penises. What? Ya you read it right. Sharks do have two reproductive organs which are known as claspers which act as penises. The claspers are the main differentiating organ between a male and a female shark. This fact may be a known fact to biologists especially people studying marine biology but is off course a new information to many people. 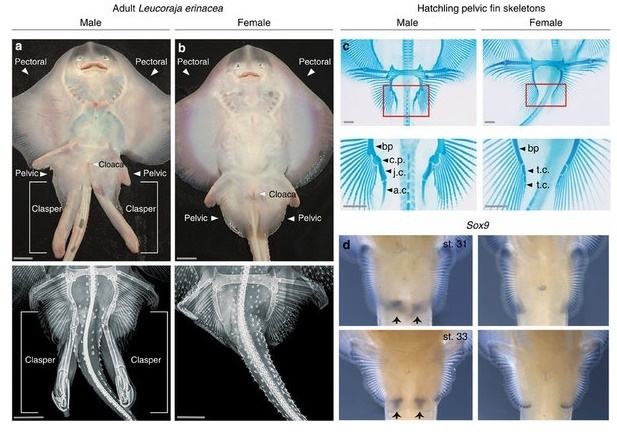 Now recently a study has been done on the biological evolution and molecular development of the copulatory organs of these fishes. In the extreme past, most of the vertebrate animals had copulatory organs which are paired penises or double penises. Now with the evolution in nature, most of the vertebrates have shed off this paired up penises but the male chondrichthyans. The sharks, skates and rays fall in this category of species. The claspers of shark extend from their pelvic fins and they are associated with internal fertilization and viviparity in Devonian placoderms. These claspers is guided by a type of hormone secretion known as Sonic hedgehog (Shh). This hormone regulation helps to induce clasping motion in the cartilage in females. In simpler sentence, the male and the female sharks have a circuit appendage which has evolved owing to Androgen reception. This is nothing but a signalling activity of male fins to allure female sharks for reproduction. If this is the case that the shark do have 2 penises then it is great for they have high chances of increasing their population even though as we all know that they were captured today by some people for medical purposes. Male sharks have two claspers because sharks have two pelvic fins. The claspers are simply a modified portion of the pelvic fin, and since there are two pelvic fins, there are two claspers.